Very nice, both quite & secure. Short walk to beach. Ate daily on balcony with lovely view. Kitchen is well equipped. Appreciated the clothes lines on the balcony and the washer and drier as we stayed two weeks. Would definitely stay here again. l REPLY: Thank you for your kind review, we hope you can come back and stay with us again. Our flight was delayed on a Sunday, and we were met at the airport by our driver who brought us to the grocery store and then to check in. We know everyone had to wait for us, and they were so patient and kind. They had a nice welcome package waiting in the fridge as well. The check in process was so quick, we were able to get to the beach for a dip after a long day of travel. West Bay Village was amazing. Our House, Flip-Flop, was spacious and well stocked. It had wifi, ac, washer/dryer and cable TV, and excellent water pressure for a nice hot shower. After a long day of playing, it felt like home. The village of homes is secure and quiet. They are eco conceious and the grounds are impeccably clean. The 24 hour security personnel really took care to make our stay safe and pleasant! Its a great place for families to stay! REPLY: Thank you very much, we are happy you all enjoyed yourselves so much. Please come back and stay with us again! Friendly, responsive and flexible. Great to work with. Everyone was great. Julio was very helpful showing us the house and arranging activities. Annabel was clean and well equipped on our arrival. The ocean view from back porch was the best. Spent much of the trip sitting in chair swing reading, Nice having air conditioning and reliable wifi. REPLY: Thank you for your kind review, Annabel sure is a special home! Loved it and we are returning next year for 4 months REPLY: We are so happy you liked Bonito Beach so much you are coming back! Thank you! Staying at Annabel was home away from home. The minute you step foot on this property you will feel the peace and tranquility that you dream of for a vacation. The home has a beautiful wrap around deck with views into the tropical foliage as well as out into the Caribbean. Relaxing in the hammocks while being peacefully swayed by the heavenly breeze was so soothing. Inside the home you will find gorgeous mahogany floors and doors and decor fitting for a Caribbean retreat. The kitchen was well stocked and the TV/Internet worked great. While there is not a beach in front of Annabel, it takes only 15 minutes to walk to West Bay beach. West Bay beach is absolutely beautiful with easy swimming and snorkeling. It can get a bit crowded on cruise ship days so getting back to the peace of Annabel was especially inviting. We especially enjoyed coffee time in the morning and wine time in the evening on the back deck. The sunrises and sunsets were spectacular with their brilliant colors and majestic clouds. 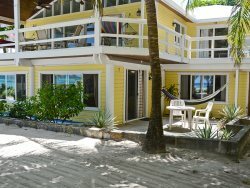 If you are considering a trip to Roatan you will be blessed to stay at Annabel...we certainly were. Thank you so much to Bob and CJ for sharing your piece of heaven with us. PS The Grand Roatan had great food. We recommend the cerviche, coconut shrimp, and the coconut mojitos! Beautiful location away from the "busy-ness" of West Bay but a short walk to get there for dining and activity. Having the spotty or non-existent internet was a problem (a few of the days) as one of our group was trying to sell their home back in the US and another was doing some work at the house. Not the house's problem but the local server - our only hitch of the week. Overall a wonderful experience at Casa Cascada. Great value also - beautiful home that was 1/2 the price of previous vacation homes we've rented in other tropical locations. REPLY: Thank you for your excellent review of Casa Cascada. You are right, it's a great location to get away from the beach area. So sorry about the internet, it is usually very good there, but we're happy it didn't spoil your vacation. We'd love to have you back! Excellent. We had some issues with losing our debit card immediately and not being able to access cash from the ATMs. Island House was extremely accommodating in helping us get the cash we needed. We are so appreciative of them for helping us! It was a perfect location and we had everything we needed! Tammy was wonderful in making sure we had an amazing time. REPLY: Thank you for your kind review. You are correct, Tammy is an awesome host! The entire crew at Island House are professional, friendly and efficient. We love staying in West Bay Village and will be back as soon as possible! The Roatan vortex has a firm hold on us. REPLY: Woohoo! Thank you very much, see you guys next time!